Taking a Las Vegas Pink Jeep tour is an interesting way to travel and see many of the famous attractions from natural landscapes to the neon lights of the Strip to national treasures. These excursions are perfect for people looking to travel in style and in small groups while riding comfortably in a customized SUV such as a Trekker or modified Wrangler jeep. The luxury SUV’s seat between six to ten people and the SUVs are loaded with amenities such as leather captain chairs, DVD players and extra-large windows for your viewing pleasure. There are a number of stellar excursions like traveling to Grand Canyon or Death Valley National Parks, driving the neon lit Strip at night, witnessing brilliantly colored landscapes at Red Rock Canyon National Conservation Area as well as the Valley of Fire State Park or you can try a trip to Hoover Dam. One of the best ways to view an incredible feat of engineering marvel from top to bottom is to try the Hoover Dam Top to Bottom by Luxury SUV with Colorado River Float Tour. Your 5-hour Las Vegas Pink Jeep tour starts with free pick-up service from your hotel where you will meet your local guide and find a seat in a ten passenger customized Trekker luxury SUV. While you are driving to this spectacular Las Vegas attraction, your guide will inform you of interesting facts of what you will see during your journey. Once at Hoover Dam you can watch a video in the visitor’s center before you take a tour of the observation deck for great photograph options of the Colorado River and Lake Mead as well as take an elevator down to the generator room. From here you will embark on your journey to the Colorado River where you will board a pontoon boat and take a 20-minute float down the river where you can see the dam up close and personal. Your adventure concludes with drop-off service at your Las Vegas hotel. Sin City is not just about bright lights as well as glitter and people looking to find interesting natural landscapes in a relaxed way should try the Red Rock Canyon Luxury tour Trekker Experience. 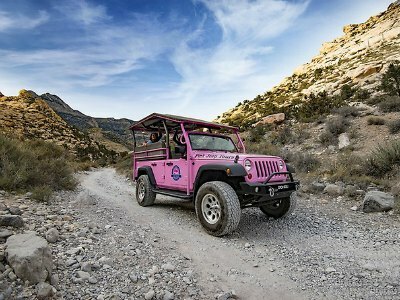 Your 4.5-hour Las Vegas Pink Jeep tour begins with complimentary pick-up service at your hotel where you will meet your expert guide and board a ten seat customized Trekker SUV that has you riding in comfort. During your travels your local guide will inform you of all the intriguing sights you are seeing and let you know some interesting facts about the history of the area. Once at Red Rock Canyon National Conservation Area you will embark on a rugged 13-mile drive through the brilliantly colored sandstone rocks carved by nature. Along the way you will see areas such as the Red Spring Mountain Range, Calico Hills, fossilized sand dunes and witness ancient Indian petroglyphs. Added bonuses on this small group Las Vegas tour is a stop at the visitor’s center and the Desert Tortoise Sanctuary. Your excursion concludes with drop-off service at your hotel. There is nothing in the world like seeing Sin City lit up at night and one of the best Las Vegas Pink Jeep tours for people seeking to see all the neon in full glory is the Las Vegas City Lights Night Tour by Open Air Jeep. Your 3.5-hour neon experience starts with free pick-up service at selected hotels where you will meet your local guide and board a six person customized open air pink Wrangler jeep. 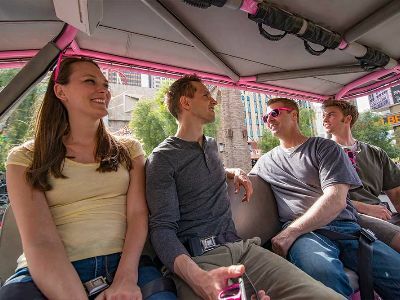 While you are cruising down the Strip your expert guide will tell entertaining stories of each location and about the history of Glitter Gulch as the city blossomed into the Entertainment Capital of the World. On your excursion you will view many of the Las Vegas attractions such as the Bellagio Fountains, the exploding volcano at the Mirage, Wedding Chapel Row, the Gold and Silver Pawn Shop as well as see all the glorious neon lighting up the sky. You will have an opportunity to stop for a photo at the Welcome to Fabulous Las Vegas Sign and you will see the 1.5-million LED lights that dance at the Fremont Street Experience. Your small group tour in Las Vegas concludes with drop-off service at selected hotels. An interesting Las Vegas Pink Jeep tour for people that like viewing intriguing natural landscapes within the largest national park south of Alaska is the Death Valley Explorer Tour by Tour Trekker. Your 10-hour adventure begins with free pick-up service at your hotel where you will board a customized ten passenger luxury Trekker SUV. As you drive through the Mojave Desert your expert guide will tell you interesting stories about the natural landscape, history and culture of the area. Once you are at Death Valley National Park you will be amazed at the stark landscape which borders the Great Basin and Mojave Desert. The national park is known for extreme temperatures both in the summer and winter as well as being home to the lowest elevation in the USA at 282-feet below sea level. When you are there you will have the opportunity to take a photograph at the Below Sea Level Sign, walk along the Badwater Salt Flats and take in amazing vistas from Dante’s View. Other interesting stops are at Devil’s Hole and Furnace Creek where you can visit the historic hotel, Oasis at Death Valley. After a pit stop at Pahrump, Nevada your excursion concludes with drop-off service at your hotel. 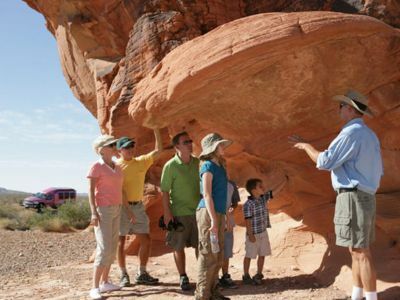 An excellent thing to do in Las Vegas for people that like to witness incredible natural landscapes, learn about interesting history and ancient cultures is to take the Valley of Fire Luxury Tour Trekker Excursion. Your 6-hour Las Vegas Pink Jeep tour begins with free pick-up service from your hotel where you will meet your expert guide and board a state-of-the-art sightseeing SUV called a Trekker. Once on the road in this ten passenger vehicle your guide will fill you in about all the interesting sights you will see on your tour. When you arrive to the Valley of Fire State Park you will be amazed at the brilliantly colored sandstone that ranges from red to orange to pink to purple which is weathered into a variety of shapes. You will make stops within the park at places like White Dome, Rainbow Vista, Fire Canyon and you will see ancient petroglyphs carved into Atlatl Rock. An added bonus on this excursion is a free box lunch which you can enjoy while gazing out over the incredible landscape. Your trip to this natural Las Vegas attraction concludes with drop-off service back at your hotel. The Hoover Dam is one of the engineering marvels of the world and the best way to experience this Las Vegas attraction is to try the Las Vegas Pink Jeep tour Hoover Dam Classic. Your 4-hour journey begins with free hotel pick-up service where you will board a customized pink ten passenger Trekker SUV and meet your expert guide who will tell you interesting stories about the history of Sin City as well as the surrounding area as you drive to Hoover Dam. Once at the dam you can stand in the observation room and take numerous photographs of the Black Canyon, the Colorado River and Lake Mead which is the largest man-made body of water in the Western Hemisphere. 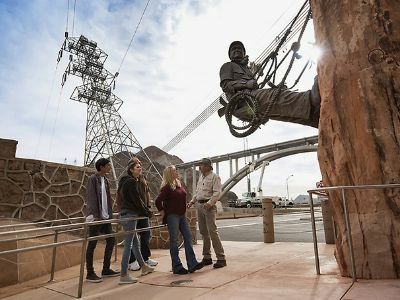 There is an assortment of interesting things to do at Hoover Dam that include looking at all the interactive exhibits within the visitor’s center, watch a video of the construction and history of the dam as well as take an elevator ride down to view the massive generators which power much of the neon signs along the Strip. Your excursion concludes with drop-off service back at your hotel. 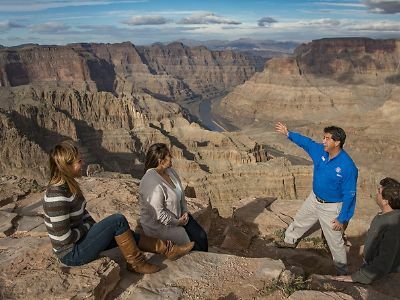 The Grand Canyon West Rim Classic Tour is an ideal thing to do in Las Vegas for visitors that want to experience one of the Seven Natural Wonders of the World. 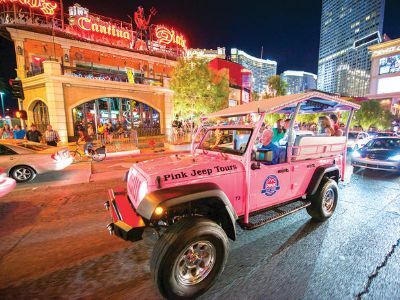 Your 9-hour Las Vegas Pink Jeep tour starts with free pick-up service from you hotel when you meet your informative guide and board a customized pink SUV that seats ten people. 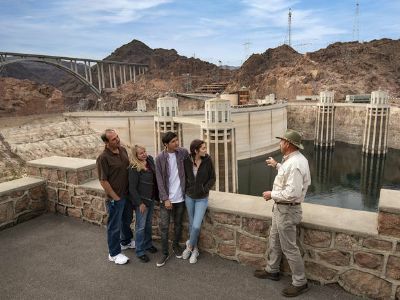 As you travel your guide talks about all the history, culture and natural landscapes that you are witnessing as you drive over Hoover Dam for photographs of the Black Canyon and the roaring Colorado River as well as a glimpse of Lake Mead. You continue traveling through the Mojave Desert as well as Joshua Tree Forest areas around Dolan Springs. 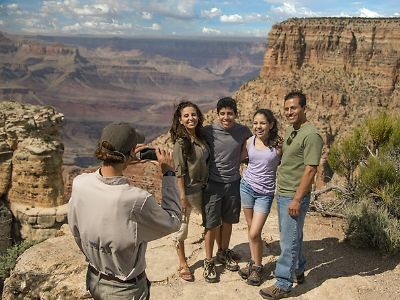 Once at the West Rim of Grand Canyon National Park you can admire the brilliantly colored canyon walls at places like the Skywalk at Eagle Point and Guano Point where you can indulge in a complimentary lunch. Also on day trip from Las Vegas you will stop at the Hualapai Indian Village where you can learn more about their culture and browse Native American handicrafts. Your journey concludes when you are dropped-off back at your hotel in Sin City. A perfect way to see the Grand Canyon, when you want to get out of Sin City for the day is to try the Grand Canyon South Rim Las Vegas Pink Jeep tour. Your 12-hour adventure starts with complimentary pick-up service at your hotel when you board a customized pink SUV that holds ten passengers and meet your experienced tour guide who will inform you of all the interesting landscapes, history and cultural aspects of journey. While you are driving to the Grand Canyon you are treated to light continental breakfast. On your journey you will pass through the Mojave Desert along historic Route 66 on your way to Williams, Arizona an Old Santa Fe Railway town before traveling through the Coconino Plateau. 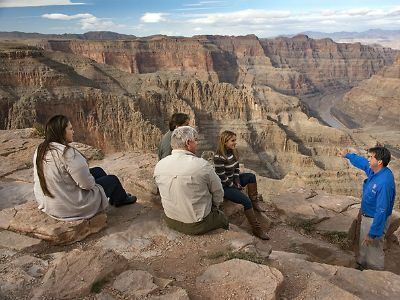 Once at the South Rim of Grand Canyon National Park you will have 3-hours to explore with your guide. After eating a free lunch on the rim overlooking the colorful canyon you will set-out with your guide to Bright Angel Trail, Mather Point and Yavapai Point while all the time gazing out into the brilliantly carved canyon. There is a stop at the visitor’s center as well as ample time to find that perfect souvenir at one of the gift shops onsite. Your day of adventure concludes with drop-off service back at your Las Vegas hotel. An excellent Las Vegas Pink Jeep tour that has you experiencing one of the Seven Natural Wonders of the World is the Grand Canyon Combo: Drive, Fly and Float Tour. Your 10-hour Las Vegas adventure begins with complimentary hotel pick-up when you board a customized pink SUV that is limited to ten people which ensures that you will get the upmost attention from your knowledgeable guide as you travel in style to the Grand Canyon. As you drive your guide will tell you interesting stories about the history, culture and natural landscape of the areas such as Joshua Tree Forest and the Grand Wash Cliffs that you pass by on your Las Vegas Pink Jeep tour. Once at the Grand Canyon you will be treated to a free lunch as you gaze out over the colorful canyon before taking an incredible helicopter flight which has you soaring above the canyon for a unique view from above. After descending 4,000-feet to the canyon floor you will have time to take a few more photos and board a pontoon boat for a slow float down the mighty Colorado River while your guide explains how the river helped form the canyon. Your flight, float and driving journey concludes with drop-off service back at your hotel. One of the best things to do in Las Vegas for visitors who like to experience interesting landscapes is to book the Red Rock Canyon with Rocky Gap Adventure Tour. Your 3-hour Las Vegas Pink Jeep tour begins when you meet your expert guide and board your customized pink Wrangler jeep. From here your guide will inform you of all the interesting landscapes and history you will see on your way to Red Rock Canyon National Conservation Area. Once at Red Rock Canyon National Conservation Area you will stop at the visitor’s center before driving a 13-mile loop trail through the canyons. Along the way you will experience outstanding landscapes like the 65-million year old Keystone Thrust Fault, Limestone Mountains and numerous fossilized sand dune areas. There are plenty of photograph opportunitiesxx at stops like the Highpoint Lookout as well as Calico Hills and when you reach Willow Springs you will be amazed at the ancient Indian petroglyphs carved into the brilliantly colored red rocks. Your adventure concludes with drop-off service back at your Las Vegas hotel. An exciting way to see all the incredible sights and sounds of numerous Las Vegas attractions is to try the Sights and Sounds Strip Tour with High Roller. Your 2-hour Pink Jeep tour in Las Vegas begins with complimentary pick-up service at your hotel where you will be driven to board your exclusive open-air pink Wrangler jeep. After a quick safety meeting you will set-off down the Strip passing by fantastic places like the Bellagio Fountains, the volcanoes at the Mirage and you will make a stop at the Welcome to Fabulous Las Vegas sign for a quick photograph. As you drive you can wave at Elvis and watch all the lovebirds along Wedding Chapel Row while listening to all the superb sounds the Strip has to offer. An added bonus on this Las Vegas excursion is a ticket to the High Roller which is the tallest observation wheel in the world at 550-feet where you can catch a bird’s eye glimpse of the Eiffel Tower. Your tour concludes with drop-off service back your hotel.